Today is National Candy Day, and two of my favorite candy bars are Almond Joy and Mounds, manufactured by Hershey's. Almond Joy has a coconut-based center topped with two toasted almonds and covered in a layer of milk chocolate. 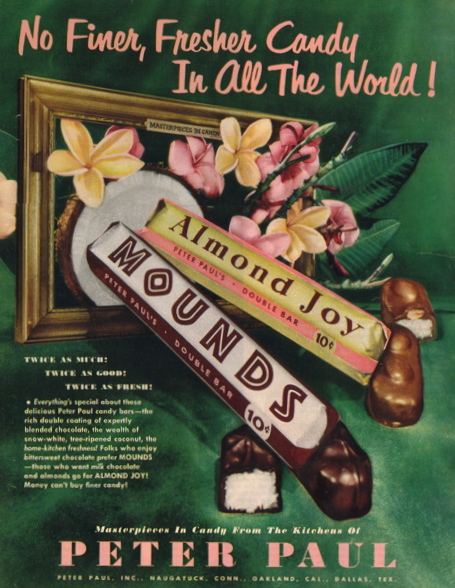 Almond Joy is the sister product of Mounds, which is the same confection but without the almond and coated with dark chocolate. I'm actually partial to Mounds, but thought I'd post a recipe for Homemade Almond Joy -- with one concession, I use dark chocolate! If you're a purist, make it a Mounds bar and leave off the Almonds. According to Wikipedia, Peter Paul Halajian, a candy retailer in Connecticut in the 1919, along with other Armenian investors, including Dutch candy manufacturer Jett Schaefer, formed the Schaefer Candy Manufacturing Company in 1919. The company first sold various brands of candies, but following sugar and coconut shortages in World War II, they dropped most brands and concentrated their efforts on the Mounds bar. The Almond Joy Bar was introduced in 1946 as a replacement for the Dream Bar (created in 1936) that contained diced almonds with the coconut. In 1978, Peter Paul merged with the Cadbury company. Hershey’s then purchased the United States portion of the combined company in 1988. During the 1970s, the Peter Paul company used the jingle, "Sometimes you feel like a nut / Sometimes you don't / Almond Joy's got nuts / Mounds don't," to advertise Almond Joy and Mounds together. In a play on words, the "feel like a nut" portion of the jingle was typically played over a clip of someone acting like a "nut", engaged in some funny-looking activity. See the Retro Commercial from 1978 below. And here's a variation on a good thing. Did you ever try any of these? In the 2000s, Hershey began producing variations of the product, including a limited edition Piña Colada and Double Chocolate Almond Joy in 2004, a limited edition White Chocolate Key Lime and Milk Chocolate Passion Fruit Almond Joy in 2005, and a limited edition Toasted Coconut Almond Joy in 2006. Although Peter Paul as a company no longer exists, the name still appears on the wrapper as part of the bars' brand names. Spread raw almonds on baking sheet and toast for about 10 minutes. Remove from oven and cool. Line baking sheet with parchment paper. Remove coconut mixture from refrigerator. With hands, shape one tablespoon of coconut into small log - 2 inches long and 3/4-inch thick. Press coconut mixture tightly together. Place logs on lined baking sheet and continue until all coconut mixture is finished. Press an almond on top of each coconut log. Place baking sheet in freezer to chill while you melt chocolate. In medium microwave safe bowl, melt chocolate in microwave 2-4 minutes at 30 SECOND intervals until chocolate is melted (or melt in top of double boiler or pan over saucepan of simmering water). Remove coconut logs from freezer. 1. Place one coconut almond log on fork. Use spoon to scoop a bit of chocolate over almond. This helps almond stick to coconut log during dipping. Lower fork into chocolate and spoon chocolate over candy to coat. Lift fork and gently shake to release some of the chocolate. Scrape bottom of fork along the side of bowl and place on lined baking sheet. You might need a toothpick to help get the candy off the fork. Repeat until all candy is coated in chocolate. If chocolate gets thick, return to microwave or heat for a tiny bit more. Let dipped candy harden for 45 minutes. Store in airtight container at room temperature. 2. Using Two Fork method (or a special dipping tool-I find this handy), dunk coconut logs in chocolate, bring up and tap on lip of bowl to remove excess chocolate. Place on parchment lined baking sheet and repeat. "Sometimes You Feel Like A Nut! Sometimes You Don't"
Enjoy this 1978 Almond Joy Mounds Commercial! How Retro!